Astanga Yoga Vijnana Mandiram (AYVM) - Articles: Are Ganga and Gowri squabbling co-wives?? Ganga and Gowri are depicted as Lord Shiva’s consorts in Puranic mythology. This has been enumerated in Epic poems, Dance, Drama, Films etc. Co-wives and the attendant rivalry, competition and fights is common knowledge. This trend gets extrapolated in the case of Ganga and Gowri too. In the show business, this gets depicted often as an unmanageable task for Lord Shiva, particularly in the narration of Dance, Drama and Films. We must bear in mind that Divine incumbents are not like mortals that are driven by sensory impulses. We should not forget that they are radiant forces that act in the spiritual world within, which can be perceived only by penance. Our perception graduates from the physical to the spiritual only when the Divinity of Ganga – Gowri is understood. Goddess Swarna Gowri is worshipped with gaiety on the auspicious third waxing day in Bhadrapada (the previous day of Ganesha Chathurthi). We are the children of the primordial Couple – Parvathi Parameshwara. Great Saints have experienced that nothing in this universe exist that is not pervaded by them. Thus prayers to Divine Mother Parvathi are auspicious. Sri Adi Shankaracharya describes her beauty as ‘Champeya Gaurardha sharirakayai‘- her hue is like that of champa flowers. Her name Gowri derives from Gaura or white. When she is out to destroy – she is Kali (Black), when she is offering education she is Shyamala (deep hue), while bestowing Sowmangalya – Sowbhagya – prosperity (auspicious presence – benevolence – Prosperity), she appears as fair as a champa flower, at other times she is spotlessly clean like snow, known as Gowri; when she pervades the three worlds as a profuse shower of knowledge within – she is known as Ganga (flowing). As the Great Lord manifests Himself as Bramha – Vishnu – Maheshwara for creation, sustenance and destruction, his consort para – prakruthi, the divine mother takes upon herself various roles and responsibilities in various forms Saraswathi – Lakshmi - Parvathi to execute different activities. Even now, the tradition exists, to obtain clay from the river bed of Ganga to prepare the idol of Gowri for worship. The epics depicts both Ganga and Gowri as daughters of King Himavaan. Ganges originates in Himalayas. According to the context of epics, Ganga is also known to spring up from - Lord Vishnu’s feet, emerge from the sacred pitcher of Brahma, daughter of Maharshi Jahnu, as Bhagirathi, the daughter of King Bhagiratha. From a spiritual or taattvic view, Ganga, is the flow of brahma vidya personified. The origin or seat of brahma vidya is the abode of the Lord. From there she descends for the wellbeing of all. Himavaan, the personification of clusters of lofty sacred mountains and the hermitage of saints is the supreme lord’s representative. When she emerges from Maharshi Jahnu’s right ear – where Jnanis hear the sound of Pranava, she may rightly be called the daughter of a Maharshi. Ganga came down to earth from the crest of the lofty mountains due to the spiritual exertions of Yogi Bhagiratha – again an allegory to the yogic experience of Brahmanubhava at the crown permeating the entire body. All these point to the fact that Ganga is the personification of the Supreme Knowledge flowing within a Jnani. Adi Shankaracharya proclaimed “tribhuvana janani vyapinee jnanaganga” –Divine Mother who as Jnana ganga engulfs three worlds. Likewise, Gowri has been proclaimed as ‘Brahma vidya swaroopini’ - embodiment of sacred knowledge. 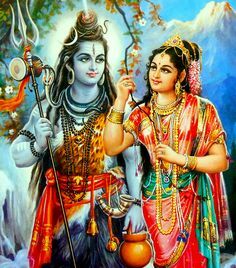 Both Ganga and Gowri as consorts of Lord Shiva are involved in propagation of the supreme knowledge embodied by Shiva. Thus Ganga and Gowri are two embodiments of para – prakruthi. The core essence of both is Knowledge. Thus, the shastras recognize them as siblings as well. It is childish and travesty of truth to perceive Ganga and Gowri as squabbling co-wives. When the brahma Jnana flows downwards, it is Ganga and while engaged in sustenance and propagation of Nature, as per the wish of the Lord, she is Gowri. On the auspicious occasion of Festival of Gowri Pooja let us worship them both with the remembrances of this sacred truth.